The Fellowship was fortunate enough to obtain a copy of AFTER EARTH: INNOCENCE from Dynamite Comics. The story is by Michael Jan Friedman and Robert Greenberger, with art by Beni Lobel. Prime Commander Raige of the United Ranger Corps answers his son’s question about going to work by telling him the story of the colony. Hundreds of years ago humans had to leave Earth because it became too toxic for it to support life. They discovered and settled on the planet Nova Corp. The colony was on the brink of civil war when an alien race called the Skrel invaded. Thanks to the information and courage of a 12 year old boy – Carter Raige, the tides were turned. He discovered a Skrel ship that parts were analyzed and adapted for new technology to use to combat the aliens and to survive. This is a prequel to the upcoming movie that stars Will Smith and Jaden Smith. The book was a good solid read, but nothing really spectacular. On the other hand, the comic has me curious about the film. I am unfamiliar with Lobel’s art, but enjoyed what I saw here. 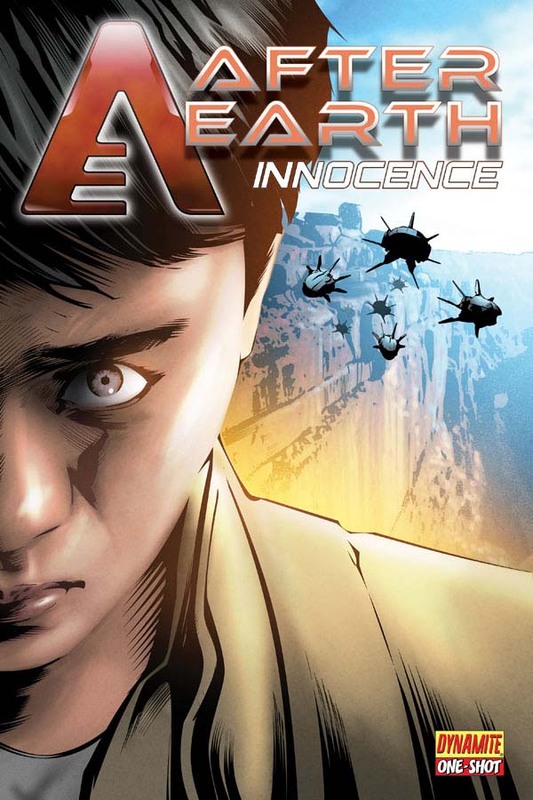 AFTER EARTH: INNOCENCE is in stores now and available at www.dynamite.net.